I have always been a confident person. I don’t know where this resilience from caring what others think of me came from. I don’t remember moments of low self-esteem in middle school; I hardly remember them in high school or college; I was probably the only Mormon girl at UCSB active in a sorority who didn't care what either group thought about me. This confidence almost crossed the line to naïvety. A piece of me didn’t waste time thinking about if others liked me because another piece of me thought, "Why wouldn’t they?" Maybe it sounds cocky when I document this attitude in writing, but it was more about confidence than cockiness. Fast forward 13 years after college, and my confidence is still intact. I believe I am a good mom and wife, I believe I am doing good in the world, but, man, I have never felt spread so thin or as tired, unattractive, vulnerable, and uncertain. There are many little moments during the course of a day when I feel this new-to-me self-confidence buster. For example, the other night around 8:30 pm, I decided to go grocery shopping at Sprouts. It’s just so much easier running errands without kids. So half asleep and grumpy because I am not in my sweats at home, I go. While there I am looking at packaged nuts when a man with a British accent comes up and starts chatting. I honestly feel shocked. I look around to confirm he is talking to me. Yes, he is, and it feels a little like he's hitting on me. (I probably had a confused face the whole time we were talking as I tried to figure out if he wanted to ask me a question.) Long story short, I never figured out if he was actually hitting on me, but that wasn’t my take home. My take home was how surprised I was that a man would find me attractive. When did that self-doubt develop? Deep down inside do I think of myself as so unappealing there's no way a stranger would find me attractive? Did I believe the only reason my husband finds me attractive is because he is my husband and I am the mother of his children? There was a time I never second guessed a random talkative stranger's intention. Well, that night was a huge eye opener because I realized negative self-esteem was creeping into my soul. This lack of confidence is not just about my motherly postpartum appearance. I have felt it creep into my ability to keep a tidy home and balance motherhood and work. Any time you go outside your comfort zone, you become vulnerable and open to self esteem issues. There are moments when launching My Be Better Box I feel on top of the world. When I witness random strangers completing the challenges to better their lives, I know I am making a difference! However, minutes later, I can be my toughest critic. So when did my forever confidence become threatened? This week’s challenge could not have come at a better time. Entering the week’s challenge, I focused on the messages my children hear that will someday become their self-talk. I loved taping the Marigold Song Design post affirmation card from this month’s My Be Better Box in Cooper’s new Planet Box. 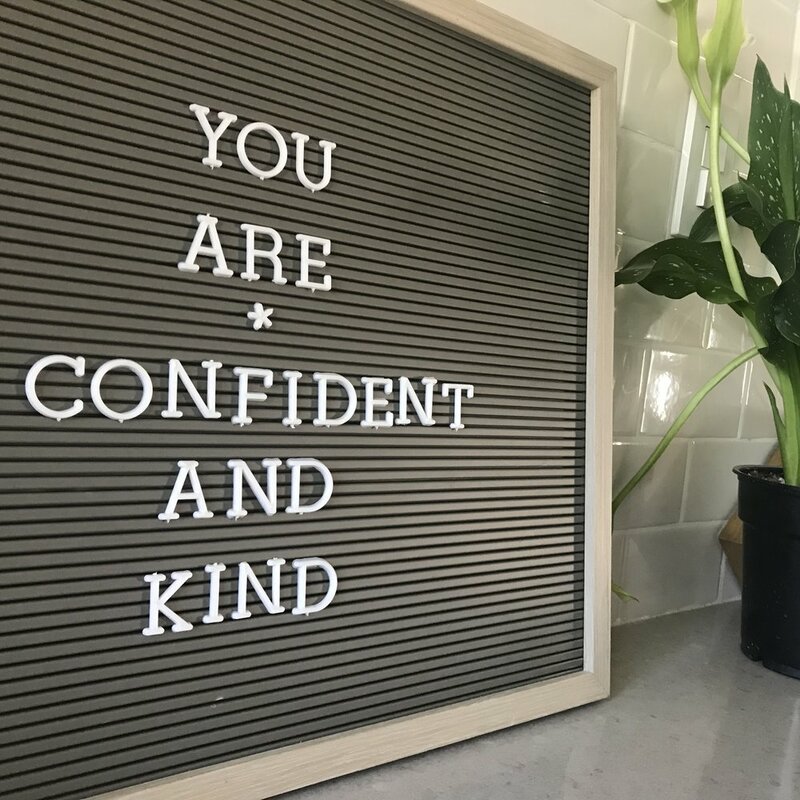 She loved them, too, and was excited to show her teachers the adorable sloth that said “I accept and love myself” and the turtle that said “I can find an answer for every problem I encounter.” On my new letter board I put up a positive affirmation for my kids to believe about themselves: I am CONFIDENT AND KIND. I love spending time with my family, and it's easy to devote this time to them. The majority of my day is spent planning fun, quality time activities outdoors (zoo, parks, Discovery Cube, walks to the circle and playdates) and indoors (dancing, reading books, bath time, snuggles, games). I love spending money on my family--on all the activities listed above, on clothes, on crafts, on healthy food, on muffins at Starbucks, etc. But when it comes time to devote any time or money on myself, for some reason, I feel guilty. This is probably a very common motherly emotion since being able to spend time and money on our kids also makes us happy. But this week I realized how guilt is unnecessary and unhealthy. As a result, my kids' and husband’s lives were also enriched. I walked (Cooper scootered) to school the two of the three days she had school, we walked to the library, we played at three different parks and an indoor play space called The Coop. My husband and I went on a date night to a Korean Spa. (If you have never been, I highly recommend the experience.) I rediscovered my confident self, the self that has served me well my whole life!